...like hearing the garbage truck on Friday morning and running outside to watch it work! He finds it both terrifying & exhilarating all at the same time! 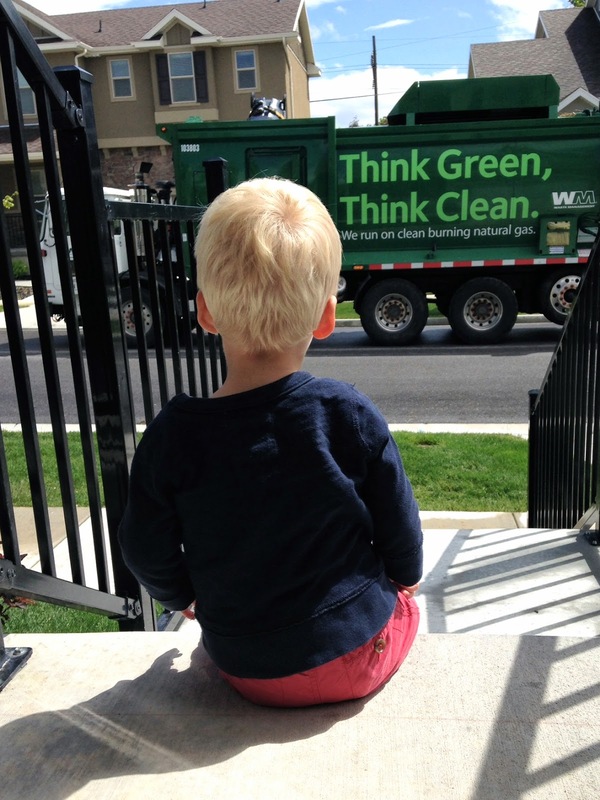 So hilarious, Jett does the same thing, runs to the front room and climbs on the couch to watch the garbage trucks =) SUCH BOYS! So funny! My son is the same way, he is scared of it yet wants to watch it too! This is a weekly occurrence at my house too. I think it's the highlight of his whole week sometimes. I make a point to tell him every Wednesday night that the garbage truck will come the next morning and he wakes up every single Thursday morning jumping up and down in his crib yelling "GARBAGE TRUCK!!" Hilarious. that is so cute! we used to love the garbage truck when we were little - except it came at like 3 or 4 am at home, and mum did not appreciate us running outside to watch it. hahaha, that is too funny...scary yet awesome all at the same time! An adrenaline rush! little boys and their trucks :) I'm sure we will be enjoying the same daily activity once we move too.